Paper Lei and Hawaiian foods popular in New York. 1912. PAPER LEI ARE MUCH SOUGHT AFTER IN NEW YORK. At the return of the head manager of the clothiers, Sachs, which stands at the corner of Fort and King Streets; [he said,] “Luau and paper lei have become popular with New Yorkers, and Hawaiian foods and lei are seen at parties given by many people on the banks of the Hudson River. Supposedly at three places that haole went to visit, he saw people holding luau parties, and the only thing missing at those places was poi, salmon, tomatoes, onions and some other foods seen at luau in Hawaii nei. One day when he went to go see one of his friends in New York, shown before him was an ilima lei and a lauhala hat upon which was a ribbon which read “Aloha,” and he said that they were a gift from Jim McCandless, as a memento. 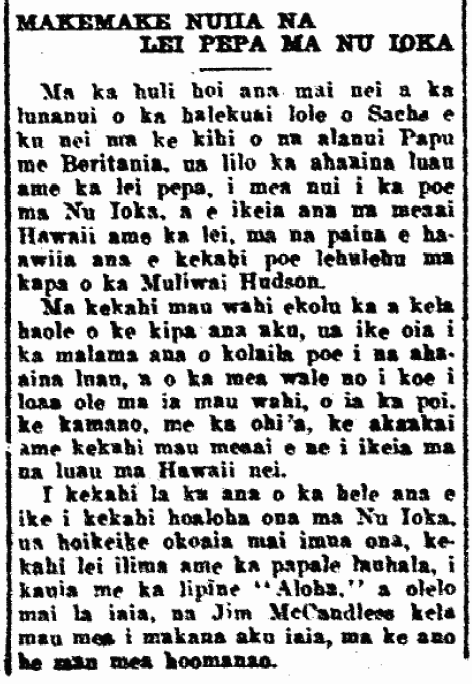 Ka Nupepa Kuokoa, Buke XLVIII, Helu 32, Aoao 6. Augate 9, 1912.